The man who invented the banana slicer also sued the pope and counseled Indira Gandhi. This man sued the pope, made a movie with Steven Spielberg, advised Indira Gandhi, and invented the banana slicer. Some inventions are the products of divine inspiration. Judge William “Banana Bill” Sheffield has never shied away from his ambitions. After graduating from Cal State–Long Beach with a degree in philosophy, he worked with former classmate Steven Spielberg on a yearlong film project, but just didn’t see promise in Hollywood. As a law student at UC–Berkeley, Sheffield successfully sued Pope Paul VI over a St. Bernard puppy that was never delivered to him from a monastery in Switzerland. At one point he even served as legal counsel for embattled Indian Prime Minister Indira Gandhi. But none of this would compare to an invention he created in hopes of truly changing the world: the banana slicer. Yes, that banana slicer. The yellow plastic device became a viral meme almost two years ago, when it inspired thousands of hilarious, satirical customer reviews online. But the story behind it goes back nearly 25 years. And as strange as it may sound, Sheffield’s story embodies the American dream. Aside from an entrepreneurial spirit, the biggest driver of his innovative spirit is his faith. During an interview with Slate, Sheffield explained how the idea for a banana slicer was not the direct result of fruit-cutting frustration, but rather a vision from God. In 1985, well into his 40s, Sheffield converted to Mormonism. This drove him to leave the California Superior Court bench, where he had worked for two years, and travel to Hong Kong to work as general counsel for the Mormon Church in Asia. Sheffield found himself walking through the crowded streets of that city one day, brainstorming potential ways to help the director of a small orphanage in India he and his wife recently met. Sheffield recalls suddenly seeing a crystal-clear vision of a flat, ladderlike, banana-shaped device. He knew it was meant to be. And then he got to work. In 1989 Sheffield met with a plastics manufacturer in Hong Kong, built and tested a prototype, then secured a patent. 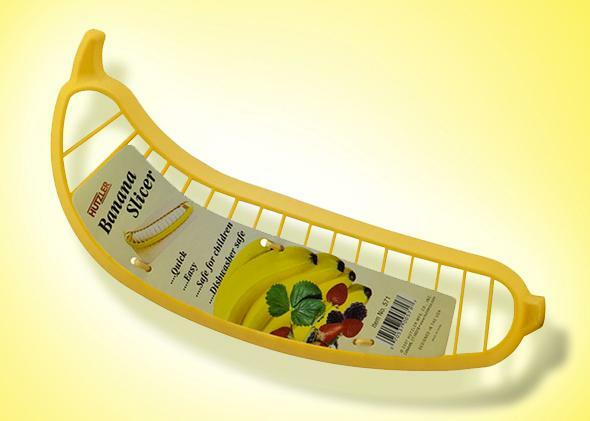 (The patent describes the banana slicer as a “tool which has a frame circumscribing an area into which a typical banana readily fits, and a plurality of spaced ribs or blades disposed transversely to the longitudinal axis of the frame and interconnecting opposite sides of the frame.”) But how would he convince every household to buy one? Sheffield purchased a book with the name and address of every grocery store in America. He wrote to CEOs, owners, and managers alike, asking them to stock their shelves with his slicer. He formed a partnership with Chiquita by flying to Cincinnati to convince a very skeptical VP of marketing that “a home with a banana slicer would buy more bananas than a home that didn’t have one.” (Sheffield says that the VP initially declined, responding that Chiquita’s “business is bananas, not banana slicers,” but he was soon sold on the product after he saw how much his kids loved it.) Inventions don’t sell themselves. The gregarious inventor sent prototypes to political leaders as well. President George H.W. Bush and first lady Barbara Bush called the invention “special.” Queen Elizabeth II’s personal chef responded, thanking Sheffield for his “great invention.” And Banana Bill’s hard work paid off: Throughout the early 1990s, he sold nearly 1 million slicers. More than 60 percent of the proceeds went directly to fund the orphanage in India, now known as Pathway. In the late 1970s, the orphanage supported about 20 disabled children. Thanks in part to Sheffield’s banana slicer, Pathway now serves more than 500 daily and has helped over 22,000 people. Now 74 years old, Sheffield no longer makes money from the banana slicer, its patent having expired in 1999. Banana Bill isn’t involved with the production of the Hutzler 571 Banana Slicer, and to his knowledge, the proceeds do not support any charitable efforts. During our phone call, I read him some of the online reviews, including one that claims the banana slicer saved a couple’s marriage. He laughed heartily, recounting letters he received from frustrated customers in the past. (One woman claimed the slicer was defective after it wouldn’t cut through the banana’s skin.) Commenting on its recent viral Internet fame, Sheffield expressed frustration that it didn’t take off in the same way back in the early ’90s, lamenting that “maybe it was a little bit ahead of its time.” The former judge still uses the device to slice bananas regularly. Back to those seemingly unbelievable stories from the introduction. In 1969, while working toward a degree in philosophy from Cal State–Long Beach, Sheffield collaborated with Steven Spielberg—a fellow Long Beach classmate and friend—on a film project titled Who Collects the Garbage?, examining the life philosophies of a diverse range of celebrity subjects. Sheffield and his soon-to-be first wife, April, traveled the world, conducting interviews with the likes of Bob Hope, Sammy Davis Jr., the king of Thailand, and the Beatles’ maharishi, among others. (He claims to have chased Pablo Picasso in his car, to no avail.) April penned an article about their experience in the June 1969 issue of Esquire. After filming each interview, he would send film back to Spielberg, with whom he held weekly telephone conferences. But the film was never completed, and Sheffield moved on, enrolling in law school at UC–Berkeley. Sheffield, who represented himself, won the case, and the church was ordered to pay up—which it refused to do. In order to recoup the awarded funds, Sheffield claims police officers seized the offering plates from St. Mary’s Cathedral one Sunday morning. According to Sheffield, the church responded by arguing that the money was a gift to the pope, and the title of this gift did not transfer to the pontiff until it had been delivered to the Vatican. Having already spent long hours on the case, Sheffield eventually had to choose between yet another hearing or taking the bar, so he let the suit drop. The money was never paid. The Indira Gandhi chapter of his life is just too much for this article, but trust me—it’s equally fascinating. Sheffield’s grandiose stories perfectly mirror his advice on innovation: “If you have the tenacity, the energy, and commitment to do it, it doesn’t matter if it is a banana slicer, an automobile, or an iPhone 5. You can sell anything you want as long as you commit to it and you’re creative. And don’t let anyone tell you it won’t work.” Sheffield will retire from legal mediation in July before embarking on a two-year mission with the Mormon Church, his wife of more than 40 years at his side. Compared with the rest of his life, that’s anything but bananas.